We are a very small in-home TICA registered family cattery located in central Michigan. Our cats are first and foremost our family pets, and are raised in our home. Our Savannahs are highly intelligent, interactive, healthy and sociable as well as beautiful. 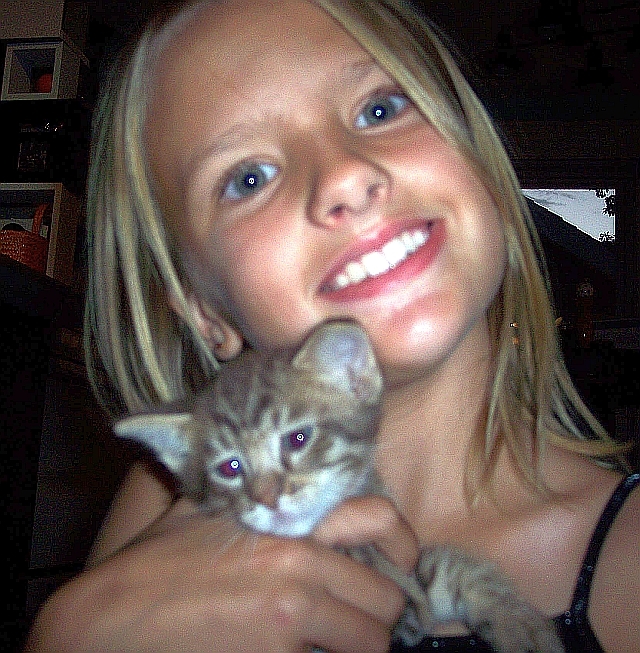 See our "Kittens" page for available kittens. Be sure to check back frequently for updates and pictures of upcoming litters! Phone: 989-560-7420 after 3 p.m.
No texts, please and thank you! 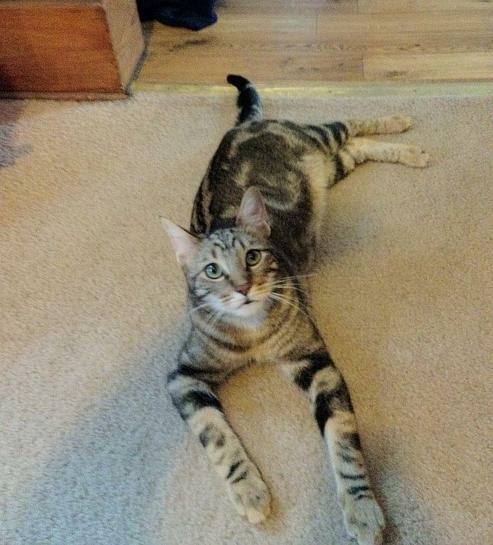 So you want a Savannah cat in your life! Perhaps you saw the cute videos on Animal Planet, or have seen pictures on the internet of gorgeous spotted kitties with tall ears, long legs and lean bodies. We highly recommend you research these beautiful domestic cats to know if they are the right fit for you and your home...and the cat. Savannahs are very intelligent and social; they are not the type of cat who sleeps all day and hides from visitors. They love to be with their people and greet and get to know new ones. Savannahs that are well-socialized are perfect pets for children that have been taught to treat pets with respect, and they often make close friends with cat-friendly dogs. Savannahs are called "dog-like" in nature due to their extremely social nature. They are VERY active and require well made toys, cat trees, regular playtime, and safe and indoor places to explore. They do NOT make good indoor/outdoor cats due to their nature to investigate everything that moves and will go chasing after every butterfly or leaf that catches their eye, at times roaming far from home in their search. They are sometimes stolen or never found if allowed outdoors, unless kept in a cat-proof enclosure with a secure roof, or walked with a well fitting secure walking jacket and leash. There are many dangers to be found outdoors, including dogs, other cats, cars, coyotes, and the unknown...we will not sell a kitten or cat to anyone who intends to allow their Savannah to roam outside. We recommend your Savannah and other pets be microchipped in case they escape. If you have researched the Savannah breed and have decided you would be the perfect home (and they are legal in your area), then take the time to research various breeders and find the one you are most comfortable with and trust. A good breeder should answer your questions promptly and be willing to offer life-long support after your kitten comes home. 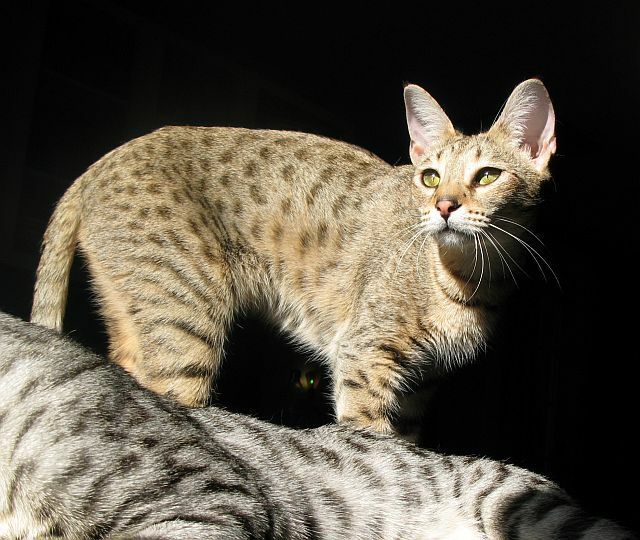 www.savannahcat.com is a very good site that lists reputable Savannah breeders throughout the world. There is sure to be a breeder listed there that has the cat or kitten that will be right for you...and the Savannah in your life! Check for available kittens on the Kittens page!